"At last, here are some easy dessert recipes from Germany that taste good!" If it's one thing the Germans can do, it's bake a good cake or knock up an amazing dessert. In fact most of my German friends love baking and I have my many of my best German cake and easy dessert recipes from them. The recipes to suit all cooking abilities. Few of us can resist a freshly baked homemade cake. In Germany you really are spoilt for choice. If you have ever visited a German bakery, then you'll know what I mean. German Black Forest Cake, Bee Sting Cake, German Cheesecake, German Apple Cake. In fact there are too many to name. Many Germans bake their own cakes though, as buying from the bakery each time tends to work out expensive. And with enough practice and my cake recipes your cakes will turn out looking shop-bought! 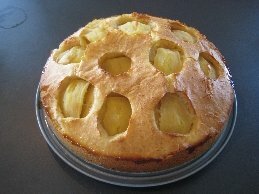 My mother-in-law has given me an excellent German apple cake recipe. It is an easy German recipe, so for those of you new to baking, give it a try. There is also a recipe for the famous Black Forest cake and a Damson Plum cake. Cakes are for all occasions, birthdays, anniveraries, christenings, weddings and also for coffee and cake in the afternoon. One thing the Germans love is a good cup of filter coffee with a slice of homemade cake. I have included easy dessert recipes, easy cake recipes and more all for you to try and enjoy. You won't be disappointed! How To Make Your Own Vanilla Sugar Make your own vanilla sugar to use in German cakes, cookies and German dessert recipes.